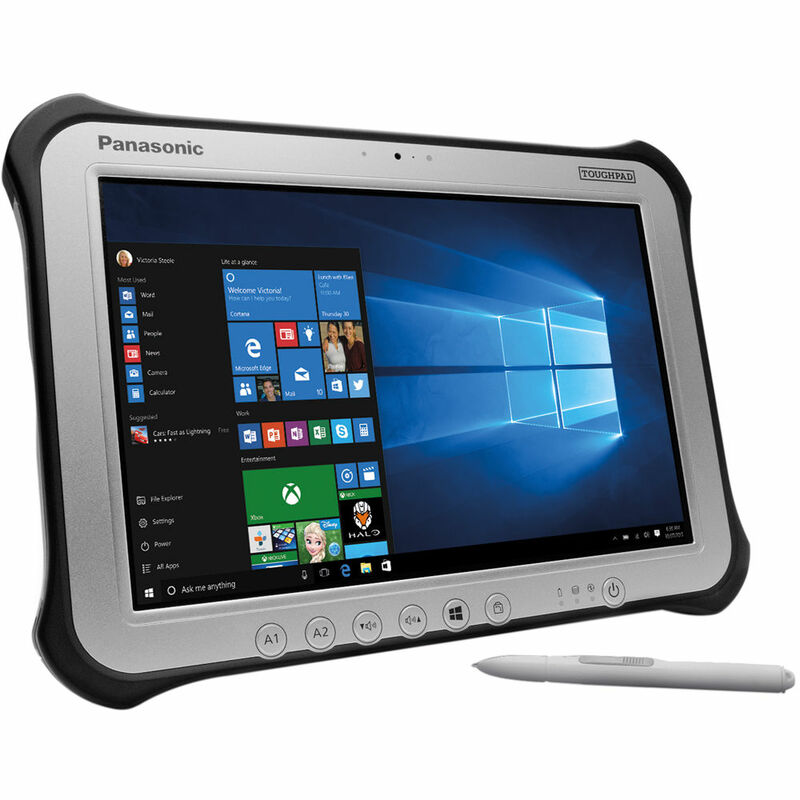 Designed users who work in challenging environments, the Panasonic 10.1" ToughPad FZ-G1 256GB Tablet is built to withstand drops from up to 4', inclement weather, and temperature changes. It's powered by a 2.4 GHz Intel Core i5-6300U Dual-Core processor and 8GB of DDR3L RAM that enables you to efficiently multitask as well as quickly access frequently used files and programs. For additional processing power, the CPU can be adjusted to 3.0 GHz with Intel Turbo Boost technology. The 10.1" multi-touch screen will respond to 10-point gestures made with both bare fingers and gloved hands, as well as the included digitizer stylus. It has a 1920 x 1200 resolution and can reach a brightness rating of 800 cd/m2 for use outdoors. The screen is anti-reflective and has gone through anti-glare treatments for additional outdoor legibility. You can use the HDMI port to connect an external display. For storage, this Toughpad has a 256GB solid state drive, which is constructed without any moving parts and can thus endure more and perform faster than a traditional hard drive. It is equipped with dual-band Wi-Fi 5 (802.11ac) that allows you to connect to the 5 GHz band for fast speeds. Connect peripherals with its USB 3.0 port and pair wireless devices using Bluetooth 4.1 technology. Other integrated features include an Infrared Hello Webcam, a rear 8MP camera, a rotating hand strap, a bridge battery, and headphone jack. The operating system installed within this Toughpad is Windows 10 Pro (64-bit). The Panasonic Toughpad FZ-G1 series tablets feature an IP65 rating that is designed to withstand dust and liquids. In addition to all-weather protection, the Toughpad FZ-G1 has been tested to survive 4' drops, shock, vibration, and temperature extremes. It comes outfitted with a magnesium alloy chassis encased with ABS and elastomer corner guards along with port covers. For LCD protection, the display has a preinstalled replaceable screen film and raised bezel.